Happy TBT! Carol Baxter here saying hello to you! 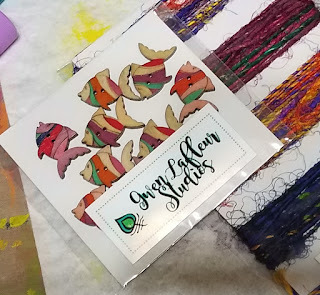 When I was cleaning up my craft table, five cute little fish buttons swam out from their hiding place ~ behind some orange paint turquoise glimmer mist. 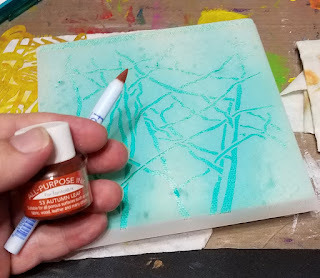 What was I to do but grab a stencil and give them a better home? You'll need a 6x6 inch canvas, Glimmer Mist, acrylic craft paint - purple, red, orange, sponge, paintbrush, cute little fish buttons available from Gwen LaFleur's web store, All Purpose Ink - Autumn, old dictionary page, glue or decopauge,scissors, a pen, needle and thread, as well as the Trees 6 Stencil by Mary Beth Shaw. Ready? This is easy. And quick! 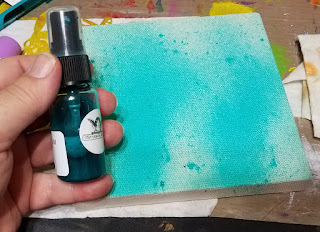 Craft in 30 minutes. You can make it with a child. It only requires a little patience (perfect, because my hubby will tell you, a little is all the patience I have). #1 Lay down newspaper under canvas and spray with mist. Tip: Hit canvas with heat gun or blow dryer BEFORE the next step! 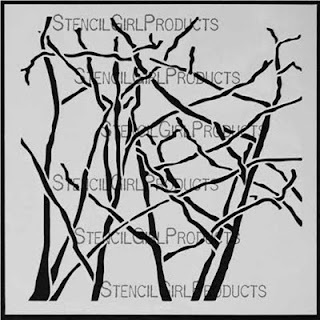 #2 Place stencil on canvas and use Fantastix and All Purpose in to color in tree lines. Quite relaxing! Remember that tip? Here's why... eek! The mist was not dry and the ink bled. Apparently, patience really is a virtue. Mary Beth's wisdom to the rescue! "When you don't like something you always can paint over it." Cue blow dryer! Clearly, I need a new plan! Think..... There are heat vents in the bottom of the sea! 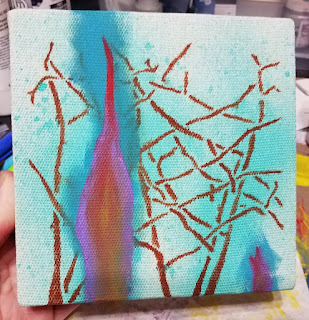 #3 I will paint a flame! I used the sponge, a paint brush and my finger. Cue blow dryer again. #4 Sew on the cutest little fishies ever! 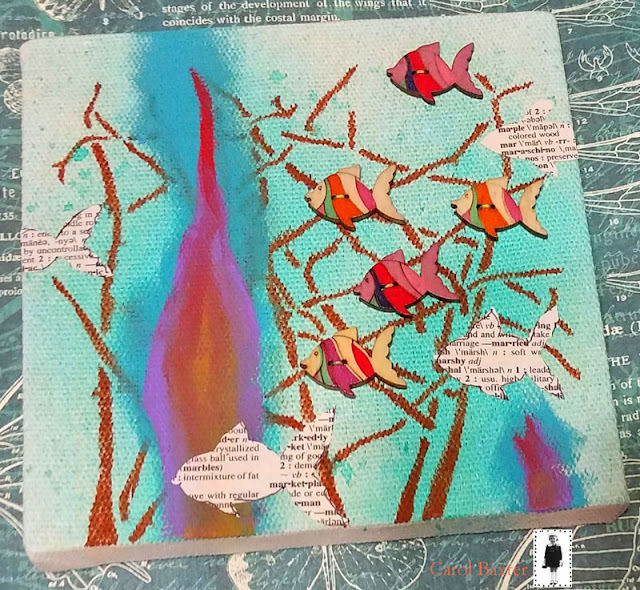 #5 And lastly, cut out some fish from old book paper and glue them on. It's a party! 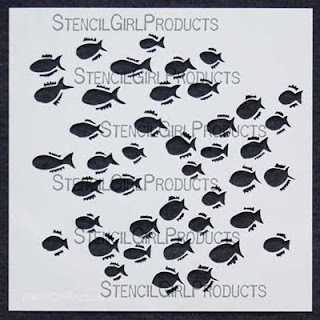 Okay, I am off to go hang my happy little school of fish on my bathroom wall. 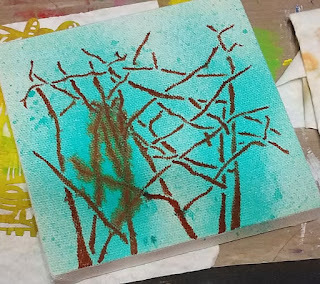 I hope you find something hiding on your art table that begs you to put a stencil on it! That's a great stencil !